We currently have just over 19,000 unanswered questions. After reviewing about 500 of them in a totally unsystematic manner I conclude that <2% are truly reasonable questions awaiting a reasonable response. That is a few hundred at most. I made a start this week answering a handful of ancient questions I thought I could tackle. In quite a few I think a nascent answer may be in the comments and others have a solid answer that has not been accepted, so we could ask the question asker to accept an answer. I do not know which other sites are comparable to ours but Academic SE has <150 questions without an accepted answer. Do we have a higher percentage than other comparable exchanges? At 81% answered we are better on that particular statistic than Stack Overflow (everyone's measuring stick) at 71% and Cross Validated (which launched at the same time as GIS SE) at 61% - see http://stackexchange.com/sites#percentanswered - but I am all for trying to get us up into the 90s - which is what Beta sites strive for. I would tell you our precise ranking if I did not have to count to find it: Numbering the List View of the SE Sites site? In many cases to move a question off our unanswered list, all it needs is for someone to upvote at least one answer to > 0 votes. Improving wording of "non-reproducible" custom close reason? was posted here, and then implemented, to give us a slightly stronger tool to use to close some of the questions that are in no shape to be answered. If you are wondering which tags result in the most unanswered questions then this SEDE query can be used to list them. The snapshots below are ordered first by the number of unanswered questions, and then by the percentage of unanswered questions. 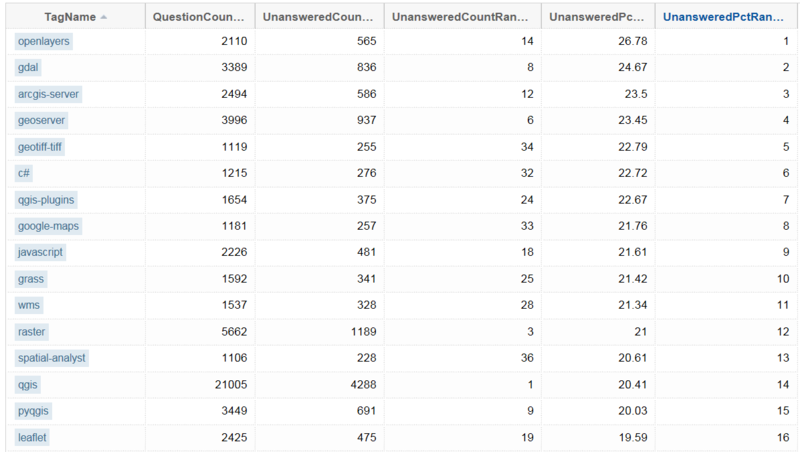 I found the query to do the above via asking a Meta SE question: Identifying tags with poorest answer rates on a site? I think that we should try to encourage people to write answers. To qualify as a long enough answer, just 2-3 sentences is needed. Recently I have been using a different search strategy to try and find those Unanswered questions where I am most likely to be able to make a difference. Amongst these there are many that have an answer, but not one that has been upvoted, which makes them count as Unanswered. If there is a reasonable answer present I upvote it. Reviewing some of them makes it apparent that answering them was either harder in the past or no one understanding the question, with time to answer it, had done so which makes some easy to answer. There are often others there that match the criteria seen in the Deleting/Closing pointless questions? Q&A so they make good candidates for close voting (often as "non-reproducible" or "unclear" or "too broad" or "needs code snippet", whichever is appropriate). If anyone is keen to make a dent in the current 20,000+ Unanswered questions you may like to try the same or a similar search strategy. I've been looking into the open questions (only the ones related to tools I know). One part of them contains potential solutions or pointers to solution in comments. Someone would have to migrate the main points from comment to answer but even then if the orignal author doesn't frequent the site anymore, they will never be accepted. Some questions turn into feature requests. They ask if something is possible, the answer is "No, file a feature request". Usually nobody writes such an answer and/or accepts it. Other questions require extensive knowledge about data and use case which the author can/does not provide. I guess those could be closed. Back when I first joined the site a few months ago, I went through a period where after checking the days questions, I'd use the rest of my 40 daily votes to try and vote up answers to questions that appeared to be correct (as well as under-rated questions) but hadn't been yet. Even managed to answer one or two as well. I did this by going to "Unanswered", sorting by "newest" and then going to the very last page. Currently page 43 when using 50 a page and then working forward. It doesn't take that long though of course with only 40 votes a day I only managed to get through probably 2-3 thousand before I gave up. Other folks may therefore want to try similar (although not everyone should start at the very "end" of time). Just to bring this question up to date and back into the fold, here is some updated data on our site's answer rate. The Stack Exchange Data Explorer has a wealth of information that can be extracted with queries such as this one: Is the rate of answered questions declining? If you compare this with other mature sites (by switching the site selector at the bottom of the query page) you'll see a similar trend. This obviously does not answer why this is happening, but I would assume it's a sign of maturity and probably closely follows the site's user population. 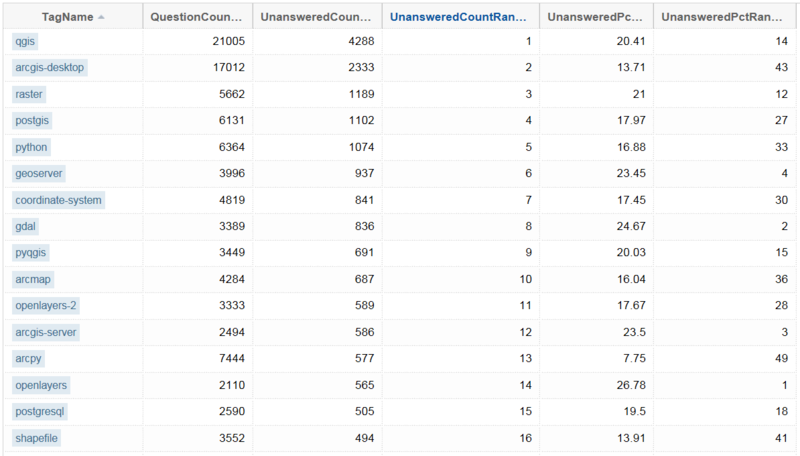 I found another very telling query here: Number of users answering or questioning. This seems to confirm something that I've suspected has been going on, which is that there are a whole lot more people asking questions than answering questions than there used to be. This is probably a natural progression with site maturity. When a site is young it is filled with enthusiastic, knowledgeable users who have been around since the dawn of (the site's) time and are both knowledgeable with the site (they know, for example, that answers yield twice the reputation that questions do) and the subject matter. As time goes on and word gets out about the site being a great resource to ask questions, the demographics change and you get a whole lot more people looking for information rather than offering it. I also think that the lack of specificity to GIS in the FAQ has been part of the reason for the lower answer rate. GIS questions tend to be highly technical in nature and very often question askers do not provide enough information or structure their question in such a way that it can be reasonably answered. A better FAQ could help. Related: (How) can we improve our FAQ? I think a lot of the problem is that so many of the unanswered questions are basically unanswerable. We get a lot of people who come to the site with a single specific problem who do not or can not provide enough detail to generate an answer and then leave the site when an answer is not forthcoming. This will also discourage people from answering older questions, as the person they are trying to help appears to be long gone. A moderator flag of Unanswerable could be useful as a way of identifying such questions, allowing a distinction to be made between these questions and good questions which have not yet been answered for other reasons. Too many questions On Hold and Closed? Asking for career and/or industry advice on GIS Stack Exchange? Using wiki answer lock on particular highly upvoted community wiki question that would be closed if asked today?